You likely wondered what prompted me to express such a controversial opinion. Well, I'll tell you. I watched Troop Beverly Hills two weeks ago. And I'm not ashamed to admit it. Because it was AMAZING. Obviously I had seen it when I was a kid. I mean, it didn't raise me to the extent that Full House did. But it was sort of like the fun aunt that you get to go stay with when your parents go on vacation without you. And then you put the fun aunt's toddler onto an office chair and spin it around and around until the toddler falls off and onto the the concrete basement floor and then fun aunt's scary husband comes and yells at you and you still feel awkward around him today even though that happened more than 21 years ago and you're a thirty-one year old man. So as you can see, Troop Beverly Hills was very influential on my upbringing. IT MADE THE TOP FIVE, YOU GUYS. Not even Bob and Cathie made the top five. And they were the only thing on the list legally required to take care of me. Well, them, and arguably number 4. I hadn't seen Troop Beverly Hills since I was a child. So it was amazing to watch it for the first time with my adult understanding. Shelley Long lives in Beverly Hills and she has an unlimited amount of money, which she plans to continue to spend despite the fact that she and her husband are divorcing for unknown reasons. Also, they have a 12-year-old daughter who looks like a Cabbage Patch Kid. Not to be outdone by her friend, Chucky. So Shelley Long decides to apply to be the daughter's troop's Wilderness Girls leader, which is basically the Girl Scouts in absolutely every way but they call them "wilderness girls" and I don't know why. 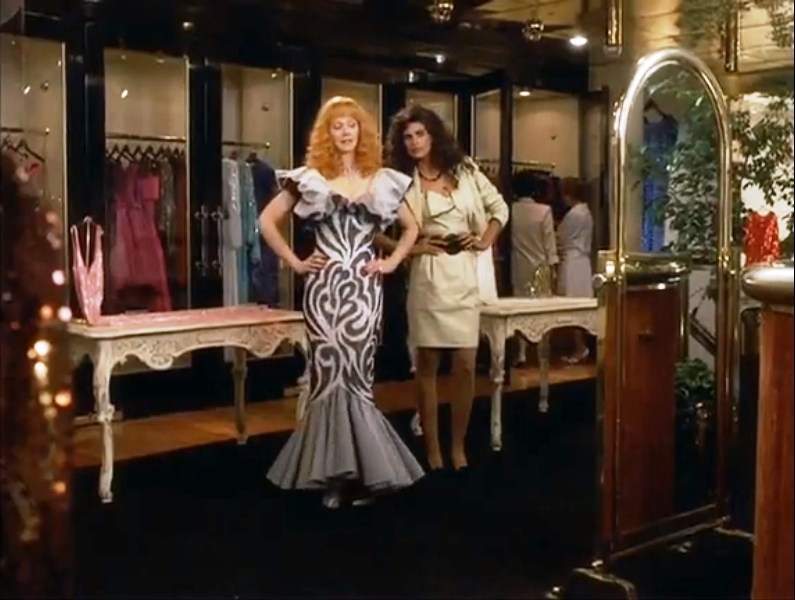 Shelley Long is in over her head because she's never been in the wilderness and her only hobby is spending literally thousands of dollars on clothes that are so ugly that 1985 called and said you can keep it. To her credit, she is apparently quite a bargainer, which skill she shrewdly displays by scoring a discount when pointing out that a bead is missing from a dress that has so many other beads on it that they could supply the Vatican's rosaries for a decade. She is hired as the troop leader for Troop Beverly Hills, which has girls in it that nearly all come from very rich parents, including one who I think is supposed to be the daughter of an evil world dictator who for some reason lives in Beverly Hills at the moment. They start having catered activities, each of which costs the combined GDP of the world's bottom 27 nations. They don't actually go into the wilderness because DUH! They're Beverly Hills girls! Instead they get pedicures and stay in a 5-star resort and eat fondue, etc. Well Velda, the extremely crotchety and (I'm just going to say it) obviously-lesbian leader of a competing troop is absolutely not pleased with Troop Beverly Hills. So Velda sends her soft-spoken assistant/servant to join Troop Beverly Hills as an assistant leader. But really she's a spy and she's supposed to take pictures of everything that goes on using a camera that's hidden inside of a book that I wanted so much as a child that I would have suffocated up to two pets to get one. The plan backfires and Shelley Long and the spy become best friends. And Velda can't seem to get the super old lady, who is basically the grand high witch of California Wilderness girls, to care about the fact that Troop Beverly Hills is winning all of these wilderness badges despite never actually going into or learning about the wilderness. Then the cookie competition begins and Troop Beverly Hills defies all expectations by selling 375,851 trillion boxes of cookies through Sister Acting their way into fundraising brilliance by putting on a concert in the streets. And Velda is PISSED. 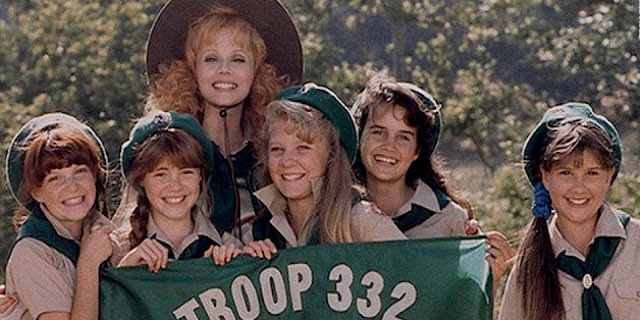 Because now this means that Troop Beverly Hills is going to have a chance to compete in the Wilderness Girls Jamboree, which is reserved for only the top cookie-selling troops. The Jamboree is basically this course in the actual wilderness wherein the troops have to follow various directions to get to an end point, and the troop that does this the fastest gets a trophy. Shelley Long's troop and Velda's troop are in stiff competition. 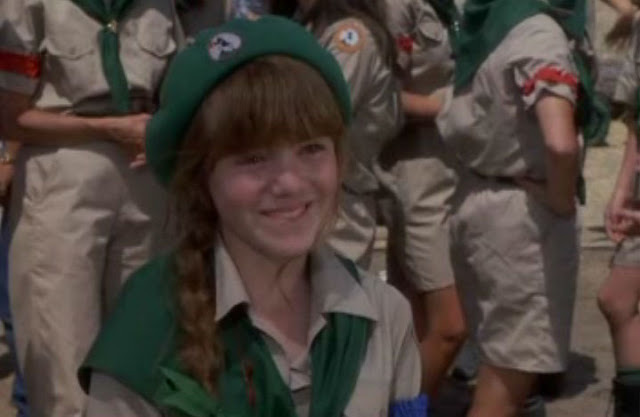 Velda's troop immediately begins cheating by changing the direction of various flags to throw off Troop Beverly Hills. Somehow Troop Beverly Hills is still able to go exactly where they are supposed to, I suppose because they are so bad at following directions that turning the flags to point the wrong way actually has no effect on them. Troop Beverly Hills barely beats Velda's troop to the stopping point on the first day of the competition, thanks to a skunk that was following them, causing them to sprint with super human speed to the finish line. Then Velda picks up the skunk by the tail and says "you'll pay for thisssssssssss." In the next scene she's wearing the skunk as a hat. Because Velda never forgets. So on day two, Velda's group cheats even more by cutting the ropes to a bridge that goes over a ravine. When Troop Beverly Hills arrives, they have a meltdown and start to admit defeat. Cabbage Patch Kid sees a log going across the ravine and she has been training for this moment her entire life because she's a gymnast. So she starts walking across the log despite her mom's protests. Then she twists her ankle and falls onto the log. So Shelley Long has to walk out there to save her and this is horrifying because she's afraid of heights and we know this because she fell out of that tree earlier in the movie when she was trying to spy on her ex-husband. Well they walk across the log, distracted by Shelley Long yelling at her daughter, and when they realize they made it, everyone cheers and forgets about the moment of life-risking mutiny. Meanwhile, Velda sprains her ankle and her bratty troop girls, who obviously haven't learned the meaning of friendship like Troop Beverly Hills has, just decide to leave her. And she is PISSSSED. Troop Beverly Hills finds Velda and they contemplate carrying her the rest of the way, even though Velda wants to be left alone because she hates Troop Beverly Hills. 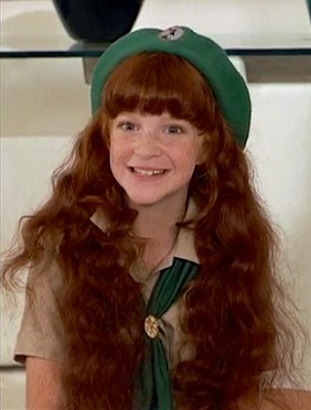 But Troop Beverly Hills is like, "we can't leave her! This is what wilderness girls is all about!" So they strap her to their backpacks and drag her to the finish line. Velda's troop comes in first but the old lady who's in charge tells them that they have to finish with their leader and since they didn't, they are disqualified. So when Troop Beverly Hills shows up dragging Velda with them, they are declared the winners. Which, technically, if Velda's body crossed the finish line before the last Troop Beverly Hills girl, I think that Velda's troop should have won. This appeal could have made a great sequel. Velda is so irate about what happened that she throws a temper tantrum and calls the boss lady a "senile old bag." And the old lady stands ready to deliver the line of the decade. The camera goes right to her face, and she's all, "I may be old, and I may be senile, but the only thing that's bagged around here is you. YOOOOOOOU'RE FIRED!" And then Velda wanders off into the wilderness screaming, because apparently she can walk again. Then everyone starts chanting "Beverly Hiiiiiiiiiills, what a thrill!" even though most of the people there are not part of Troop Beverly Hills. Oh, and the ex-husband shows up and kisses Shelley Long because apparently their relationship is going to be fine now. Finally, the last scene shows Velda working at K-Mart, which is literally the worst. And she begrudgingly makes an ironic announcement that the K-Mart special on aisle nine is "cookiesssss." So, yeah. 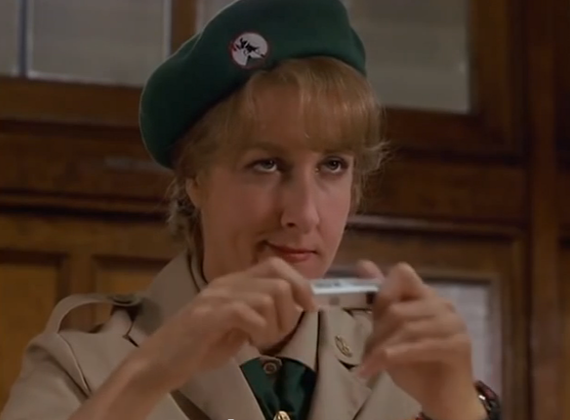 Troop Beverly Hills is basically one of the most important films of our time. WHAT THE WHAT!?!? Hiw about cueing us "SpoilerAlert". Now I know how it ends!! This is a masterpiece. This is a freaking masterpiece. Excellent recap but I'm a little disappointed you failed to mention that ex-husband is played by Craig T. Nelson - which makes the fact that they're back together more believable because Coach/Pops Braverman always does the right thing in the end. I was wondering that very same thing! I'm just assuming, since his explanation didn't match Cathie's when she finally gave me "the talk" two years ago. Dammit, I ran out of popcorn just as the Jamboree was beginning. What did I miss? I am pretty disappointed that there was no mention of the pivotal plot point, Chica Barnfell parents FORGOT HER BIRTHDAY!!!... I mean come on! This was a failure. And I'm embarrassed. Excuse me, but did you think you were just going to slip this in and nobody would insist that you make a video of yourself rapping an Aaron Carter song? Don't fight it, Eli. It's what we all want. How could you not mention that the Cabbage Patch Kid daughter is Jenny Lewis? Jenny Lewis' music is amazing. My biggest takeaway from this movie is that someone hired Harriet to be in something other than Small Wonder. I am so happy and grateful for this entire movie plot being written out here, as I no longer have any need to see it. Thank you, Eli. This is my favorite movie of ALL TIME. Recently, I showed it to my 10 and 7 year old daughters and was made painfully aware that what was rated PG back then, is definitely more PG-13 these days. Luckily, it pretty much went over their heads because I would just tell "Beverly Hills what a thrill!" over the sexual innuendos between Shelley Long and Craig T Nelson.